Soothe bumps & grazes at home or away. Includes 40 components. Paw Patrol First Aid Kit Finger plasters, large plasters, graze plasters, cleansing wipes, forehead thermometer, dressing pads, tweezers, hero stickers Comfort kids with this handy first aid kit and turn tears into smiles. 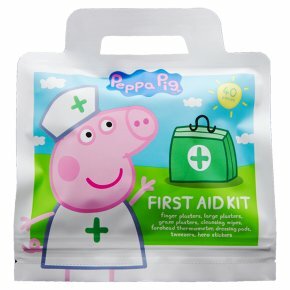 The Peppa Pig First Aid Kit Comforts and cares for small grazes and turns tears into smiles! Directions: Wash hand before and after treating a wound. Gently clean the wound with cleansing wipe. Dry the skin and apply plaster without stretching. Change plaster daily. If wound does not appear to heal or continues to bleed, seek medical advice. Thermometer: Instructions included. Retain packaging for instructions. Caution: This first aid kit is not a toy, use with adult supervision. Stop using immediately if irritation occurs. Use plasters and wipes only once, do not use if individual wrappers are damaged. Store in a cool dry place. Do not use after expiry date.<br><br>Tweezers: Not a toy, used with adult supervision.